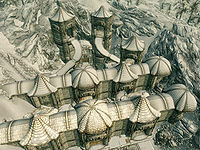 Mzinchaleft is a large Dwarven ruin located southwest of Dawnstar. The easiest way to find it is to travel to Dawnstar and then take the path past the Windward ruins until it then bends to approach from the southeast. Upon approaching you will see two long roofs with a pair of towers behind. In the middle of the nearest building is a small wooden structure with a bandit standing guard at the top. To the right of this is a doorway that leads into a covered corridor. Partway along it, on your left, is a wooden table with a mead barrel, goat cheese wedge and sliced goat cheese. Past this the corridor opens out into an uncovered corridor with a table halfway along it, at which a bandit is seated. There are several boxes and crates along this corridor and an unlocked chest behind where the bandit is seated. On your left are two doorways leading to the same covered corridor, with a couple of barrels in the corner. At the other end is a table with a woodcutter's axe and a written work order. Above this is a rack with a rabbit hanging from it and a pheasant lying on the ground below. To the left of this is a doorway straight back out into the inner area with ramps leading up to two separate towers and stairs leading down to the main entrance. In front of you is a fire with a cooking pot and spit hanging over it, beside which is another bandit sitting on a chair. Behind the spit, on top of a barrel and a table, rest a couple of sacks. To the right is the start of a ramp with a covered area that contains a bedroll and a couple of barrels containing food. At the top of the ramp is another covered tower with a table, on top of which lies an iron helmet and a bow of leveled quality (up to elven). Turning to the left in front of the fire you can either take the stairs down or walk around to another ramp. Choosing the latter, you will pass on your left a lean-to with a bedroll, an iron mace and an iron shield under it. This ramp leads to the second tower and another covered area containing more food barrels and an adept-locked chest. Taking the stairs down you will come to the main entrance, to the right of which are eight iron arrows (seven stacked in a quiver, one by itself) lying on a crate. There are three more bandits around the exterior who will all come running once battle is joined. Upon entering you are in a dimly lit corridor descending to the north. 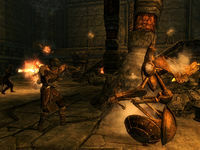 At the first turn you will find the remains of two Dwarven spiders and two carts—one filled with Dwemer-styled dressers and the other appears to have dropped a load of four cogs. The path continues descending to the east. At the bottom, where the corridor turns to the north again, are the remains of a Dwarven sphere. As you proceed you will overhear two bandits talking. They are just around the next corner standing on either side of a fire pit with an empty pot hanging over it. To the right of the fire is a wooden block with a woodcutter's axe on top of it. Hanging from a rack above is a pheasant and a garlic braid. To the left is another empty pot with a plate holding a leg of goat roast with a potato beside it. On your left as you approach the fire is a round wooden table holding a bowl of vegetable soup, a carrot, two slaughterfish eggs, a stamina poison and a vigor poison. Beside the table is an open gate leading to a small area with two bedrolls, an unlocked chest, a random healing potion, and a bucket containing a taproot, a red and green apple and a potato. Past this camp the corridor turns again to the north, continues for a few feet and then turns to the west and descends again. Take care as there is a bandit patrolling up to this corner. There are also the remains of a Dwarven sphere by a pillar. At the bottom of this ramp there is an opening on the right, where two bandits are standing. They have made a campfire there with a cauldron sitting in the flames. Around the room are two long wooden tables, barrels, an unlocked chest and archery target. On the left-hand table is a set of fur armor, an iron mace, an iron helmet and two random magicka potions. On the right-hand table is a pair of fur bracers and helmet, a goat cheese wedge and loaf of bread. One of the barrels has a leek atop. The corridor continues past this opening and ends at a junction. To the right (north) is an adept-locked door with a leveled bandit standing guard. The guard carries a key that opens this door. Through the door you can follow the path behind a wall to a sleeping area with four single, stone beds. This is where you will find Maluril if you have received the relevant quest. At the far end is an unlocked chest with a table to the right of it. On the table rest the remains of a Dwarven spider, two Dwemer cogs, a leveled magicka potion, a leveled healing potion, a flask of Dwarven oil, a ruined book (see bugs), a Dwemer bowl and Maluril's journal. Opposite, on a stone table, is a copy of the speech skill book A Dance in Fire, v7. To the south at the previous junction are the remains of a Dwarven sphere at the top of a ramp leading down to a closed gate. You can hear fighting through the gate and see bandits and automatons fighting. Through the gate is a room with a raised walkway around most of the room with two flights of stairs up to the two sections. Initially, there are two bandits and two leveled Dwarven spheres in the central area and two more bandits on either raised walkway. Defeat any remaining enemies before exploring. There is an open door diagonally opposite. On the right-hand raised area is a Dwemer dresser with a few items and an empty Dwemer chest. The corridor leading from this room continues for a few feet, passing a couple of sets of shelves and stone benches before turning to the west. Along here by a broken piece of metalwork on the right is a Dwemer bowl. Once past this the corridor opens out again and in front of you at the next corner is a Dwarven spider. At this point the corridor turns to the north, then back to the west almost immediately. To the north is a closed gate, behind which are the remains of a Dwarven centurion that can be looted for the all important centurion dynamo core. Continuing along the corridor to the west you will pass a broken pipe in the middle of the pathway. On either side of the broken pipe are gates, the one on the left being open, but neither of these areas holds anything of importance. Further on there is a second pair of gates: the one on the right is open and there is a Dwemer gyro behind it. The one on the left is adept-locked and is hiding an unlocked Dwemer chest. As you approach the second pair of gates a Dwarven spider will drop from a scuttle in front of you and start roaming. Before reaching the corner you will pass a knocked over set of shelves on the left that contains various metal items. The corridor turns to the north again. Through the open gates in front of you is a stone table holding a gyro, two plates and two cups. There is a metal chair by the table and a metal bench to the right, beside a set of shelves. The corridor turns back to the west. As you continue you will see three scuttles along this stretch of corridor with a fourth ahead at the next corner. From this one a leveled Dwarven sphere will drop. At this corner the corridor turns to the north and passes through a doorway at the top of the stairs into the next room. There are two horizontal pipes on the left and another leveled Dwarven sphere patrolling at the bottom, there is also the possibility of a second dropping from a scuttle. Once you have dealt with these you can descend the stairs and walk along the pipes on the left to reach an unlocked Dwemer chest. At the bottom of the stairs the room opens out on the right. There are the remains of a Dwarven sphere and various pieces of metal around the room. There are closed gates to the east that lead into the next room. In the next room, around the corner, is a lever that operates a set of spears as part of a puzzle you need to solve to proceed. The order to activate the levers is as follows: 1, 2, 4, 2, 3, 5, 3, 2, 6. 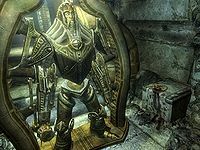 The sixth area has a red valve instead and holds two different types of Dwemer chests—a small unlocked one and a long master-locked one. The valve lowers all of the spears simultaneously and allows access onward. Once past the puzzle there is a door to the south that opens to reveal a lift that takes you to Mzinchaleft Depths. After descending in the lift, you emerge in a dimly lit corridor with the remains of a Dwarven spider and dead Falmer on the ground before a door. Through the door is a raised walkway above a flooded area heading north. Ahead the path splits; to the west it ends after a few dozen feet at a Falmer tent, with a Falmer guarding this path. Turning east leads to another Falmer standing by a lit tower with a junction south and east. There is a Falmer sword on your left. To the south is a building guarded by a chaurus that is covered with cobwebs, with plenty of chaurus egg sacs, several glowing mushrooms and an unlocked chest in the back corner. Heading east ends in an open area with a Falmer tent in front of you, to the left of it is a Falmer hive, from which a Falmer emerges as you approach. From here you can turn left or right and descend stairways to the flooded section. Turning left leads past a door leading deeper into the ruin to an area with more Falmer, on your right as you turn the corner is another hive with another Falmer hiding inside. To the left of this is a stone table with two chaurus eggs, a Falmer bow and two Dwemer cogs on top. At the far end is a Falmer tent and in the corner a hive with another Falmer inside. Once they are all taken care of you are free to explore the remainder of the room. 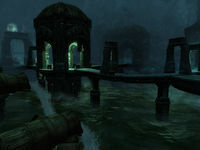 Return to the central junction on the walkway and face north, using whirlwind sprint you can reach an unlocked Dwemer chest (it is also possible to walk along the ledge to the chest, hugging the wall tightly). To fully explore the flooded section you will need a light source and enchanted waterbreathing item or spell. Beneath this first chest, underwater, is another unlocked chest. Descending the southern stairway and turning left at the bottom you'll find underwater a closed gate leading to a living area with a stone table holding a flask of Dwarven oil and two unlocked chests in the sleeping area. It is also possible to climb near some broken pipes to the north and reach the rooftops that give you access to deeper in the ruin and enable you to snipe one or more Falmer. Through the door heading east is a corridor that almost immediately turns to the south before descending a flight of stairs, turning to the east and opening into a room that is laid out like a courtroom with rows of benches laid out before a raised section. There are two Falmer in this room—one on the lower level and the other on the raised section. There are four rows of three benches with a low wall in front of them. On the other side of the walls are two tables, on the right-hand one is a solid Dwemer metal. Climbing the stairs to the raised section there is a long stone table with three stone chairs behind it facing the rest of the room. On this table are a Dwemer gyro, gear and bowl. 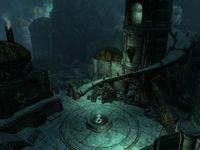 At the bottom of the stairs to the raised section in the northeastern corner is a large decorative Dwemer strut. The exit from the room is behind a wall in the northeast corner. This leads out into a corridor heading north and into a tunnel, a short way into which a Falmer is standing. The tunnel has many stone pillars supporting it. It turns to the west after a few hundred paces. It then enters a cave, in the entrance of which there is a tripwire that activates a claw that is hinged on the left. Beyond the claw is a chaurus and Falmer. The cave behind the claw has a raised section on the left and along the rear wall with a Falmer tent at either end. Both tents are gated—the one on the left contains an unlocked Falmer chest and the other a dead bandit. There are several chaurus egg sacs around the room, with the tunnel exit in the north wall. After a few feet the tunnel turns to the west, with three glowing mushrooms growing on the wall at the corner. From here the tunnel descends before ending in a gated area. The gate isn't locked and leads out into a courtyard with a central fountain with several Falmer in and around two tents behind. There is also a path up some steps on your left, but this way is blocked by spears. The right-hand tent has an unlocked chest inside, with another on each side and to the left is a Falmer shield and also the start of a curving ramp leading up to the top of a tower. At the top there is a Falmer gate blocking access to a Falmer that is guarding the button to lower the spears blocking the path forward. There are two tables opposite each other—the left-hand one has a Falmer bow and three arrows and the other has two chaurus eggs and a glowing mushroom sample. There is also a walkway joining this tower with an expert-locked room behind. Through the gate the room splits to the left and right. 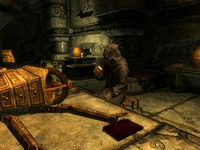 To the right is a table holding an unlocked chest and a full set of Falmer armor including a shield beside the table. To the left is a table with an unlocked chest, Falmer helmet and flask of Dwarven oil. Through the previously blocked gateway is another courtyard area with two tents, two Falmer roaming, and a central fountain with a chest beside it. To the north is a gateway to a long flight of stairs up to a door leading to Mzinchaleft Gatehouse with the remains of a Dwarven sphere and spider, a dead Falmer before the climb and another at the top of the stair. Opposite on the south wall is a Falmer hive with a Falmer hiding inside and to the right of this is an adept-locked door to another room containing a large stone table holding the remains of a Dwarven centurion, a centurion dynamo core, various pieces of metal and a couple of flasks of Dwarven oil. Opposite on another table is an unlocked chest. Through the door you are in a short corridor that turns to the west a few feet after the door. Around the corner you can see a Dwarven centurion at a docking station. This is the main boss, however it is likely that a Dwarven sphere will emerge from a scuttle during your fight. Once they are dealt with you are free to explore this room. The room has several raised sections in the corners and to the north is a section blocked by spears. The lever for these is to the right. Behind the spears is a table with an unlocked chest in front of it. On the table are various metal items including four cogs and a dresser holding various metal items. There is a scuttle on either side of the path between the docking station and the corridor you enter the room through. In the southwest corner is a gated area and there are stairs up to the raised area to the northwest. At the top of the stairs there is a Dwemer dresser among some rubble that has been knocked over, but still contains a few items. From this section you can traverse some pipes to the east to reach the next area. Here you will find a pair of Dwarven boots, a helmet, some oil and various metal items all on a table. There are also more pipes heading south taking you to the third and final raised section that has two tables holding a Dwarven sword and shield, an ingot and various metal items. In the gated area there is a Dwarven mechanism which, unless you have an attunement sphere, you are unable to activate. Activating it reveals a set of stairs leading to an entrance to Blackreach. To the right of the docking station there is a leveled shield and Grimsever. Behind the docking station is a door that leads to another lift, which takes you back to the surface. There is a lever on your right to lower the spears blocking your exit. You will emerge to the west of the main entrance. The second zone contains a full set of Falmer armor behind an expert locked door, which is much like steel in quality, but with a different appearance. The first zone contains a copy of the Speech skill book A Dance in Fire, v.7 in Maluril's room, which has an adept-level lock, the key to which is usually found on the guard near the door. You can also find his journal in this room. Three chests can be found underwater in Mzinchaleft Depths. 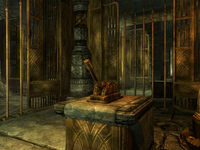 The unique glass sword Grimsever is in the last room (Mzinchaleft Gatehouse), on a stone tablet next to the Dwemer centurion gantry. It is required for the quest Grimsever's Return. The ruin is on the border between The Pale and Hjaalmarch. 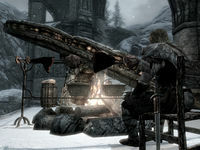 It is considered to be in Hjaalmarch by the game. This issue has been addressed by version 2.1.1 of the Unofficial Skyrim Patch; it has been set to be part of The Pale instead. Your follower may be unable to walk up the initial steps into Mzinchaleft's entrance to follow you into it. ? If you proceed, they will eventually be moved inside automatically. In the partially submerged area in Mzinchaleft Depths, there is a glitched out area behind one of the half-sunken buildings that can be reached by jumping and seam walking. It will appear to be water, but it is outside of the rest of the area. Continuing down will lead to an area that you can breathe in, and further exploration will sometimes cause you to instantaneously pop into other random areas of Mzinchaleft. ? 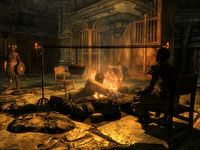 In the Falmer Camp area shown above, the player can jump up the rubble blocking the doorway and become able to look through the wall behind the Falmer tent as if it were not there. ? In Maluril's room there's a ruined book on the table that will be marked as stolen. This page was last modified on 15 April 2019, at 05:51.